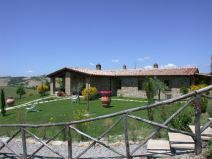 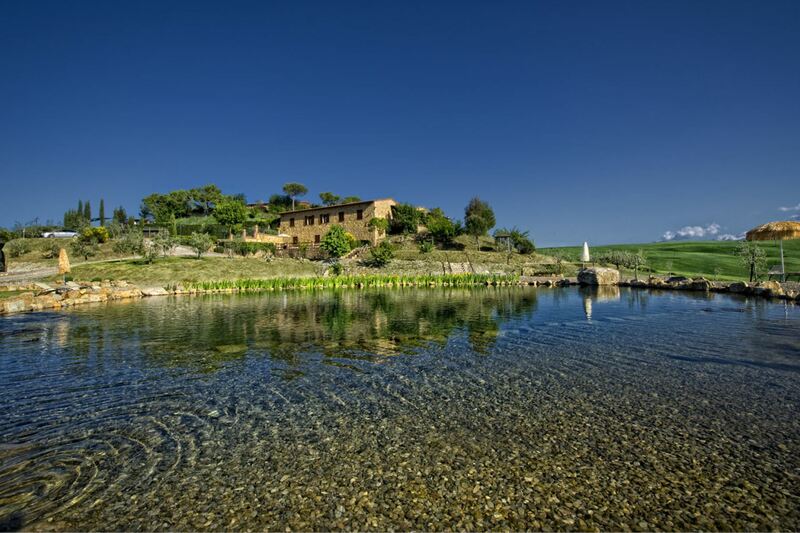 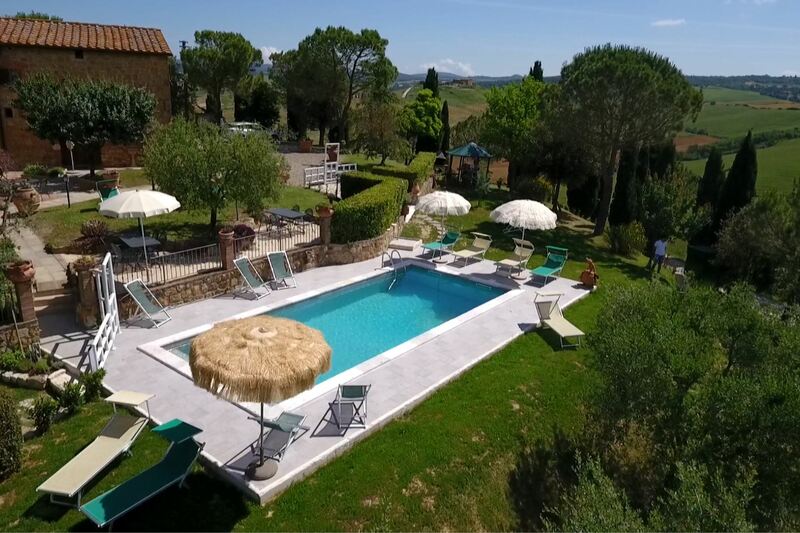 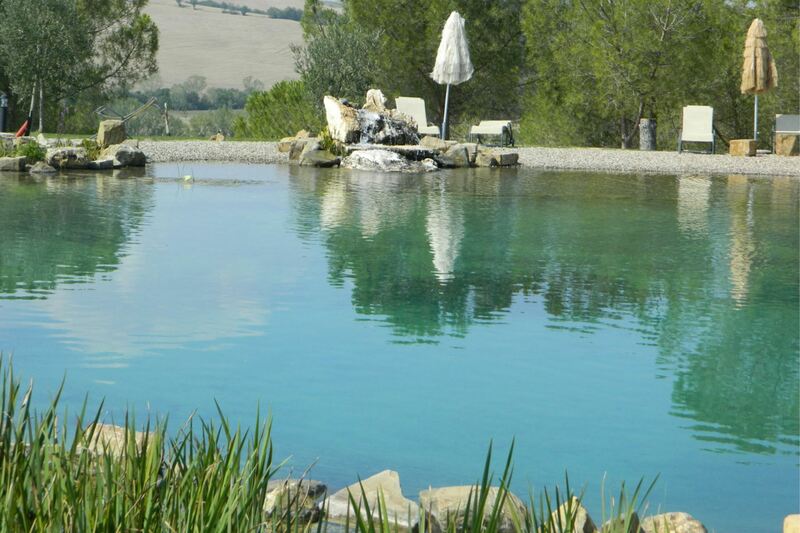 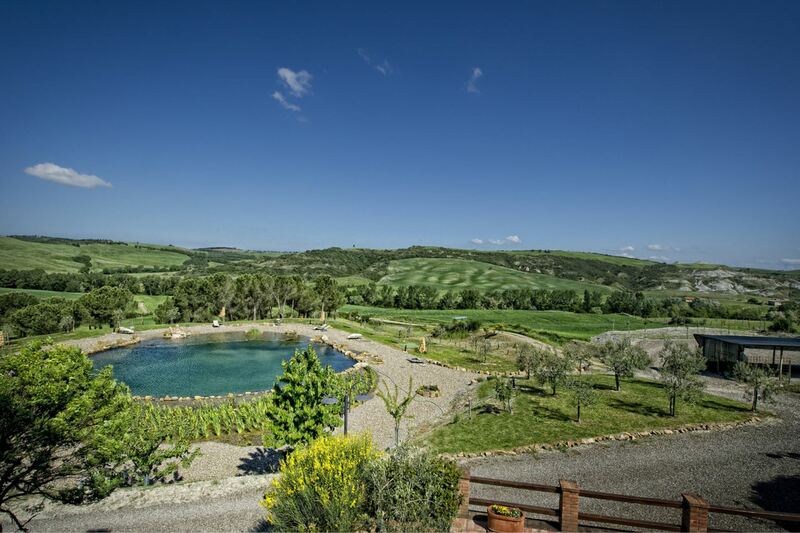 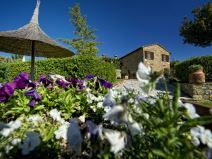 Ground floor apartment for 4 persons in a panoramic Agriturismo in Val d'Orcia, equipped with all comforts: Air conditioning, satellite-TV, Wi-Fi, pool, bio-lake and small typical restaurant. 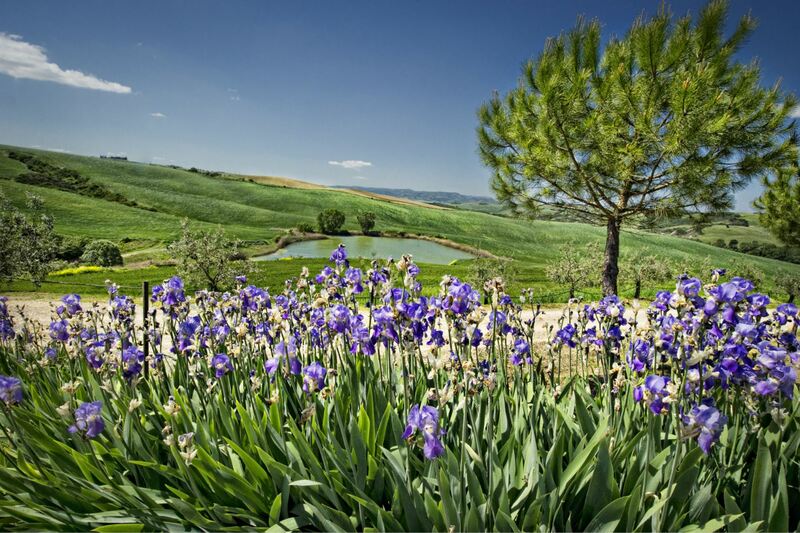 The worldwide famous Val d'Orcia. 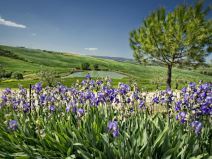 The Val d'Orcia is a wide valley located in the province of Siena, in the north-east of Mount Amiata and crossed by the river Orcia, which names it. 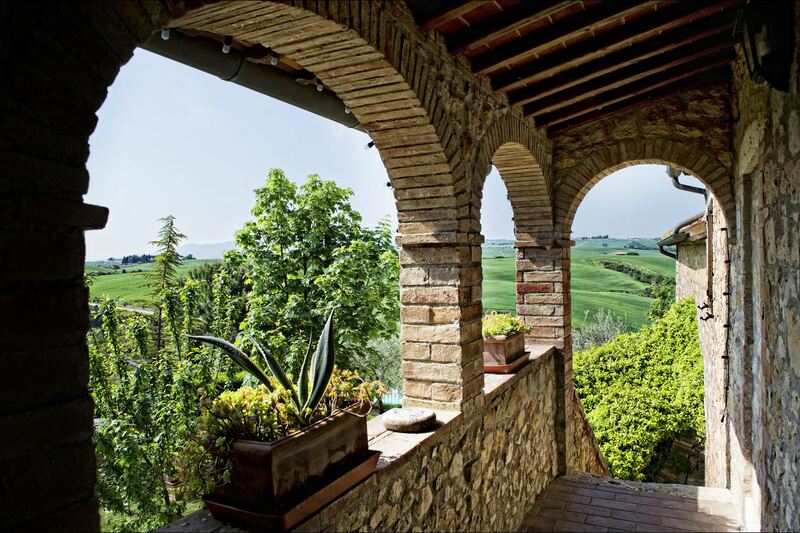 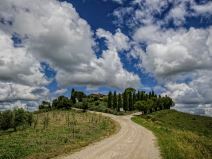 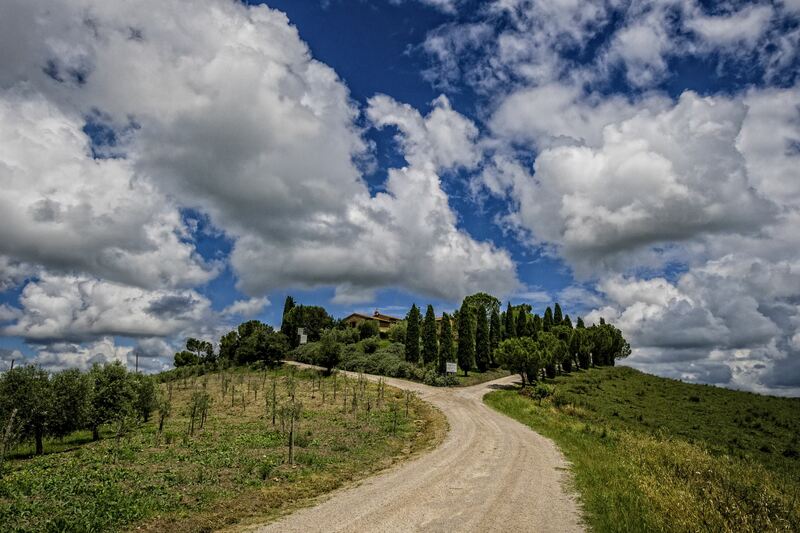 Famous all over the world because of its peculiar territory characterized by enchanting hill views and the lovely medieval villages such as Pienza, Montalcino, Montepulciano, San Quirico d'Orcia, Monticchiello. 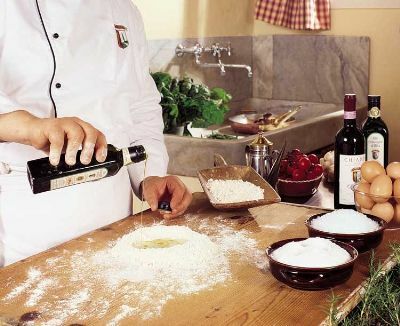 The Val d'Orcia is recalled for its typical dishes (the 'Pecorino' cheese of Pienza, the 'Pici') always accompanied by world-wide known wines such as the Brunello of Montalcino and the Nobile of Montepulciano. 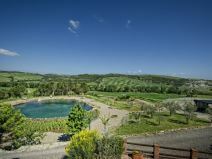 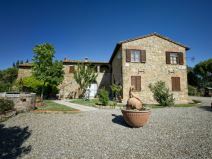 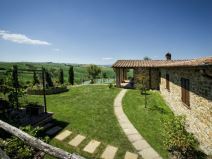 The apartments and the restaurant, a few km away from Pienza. 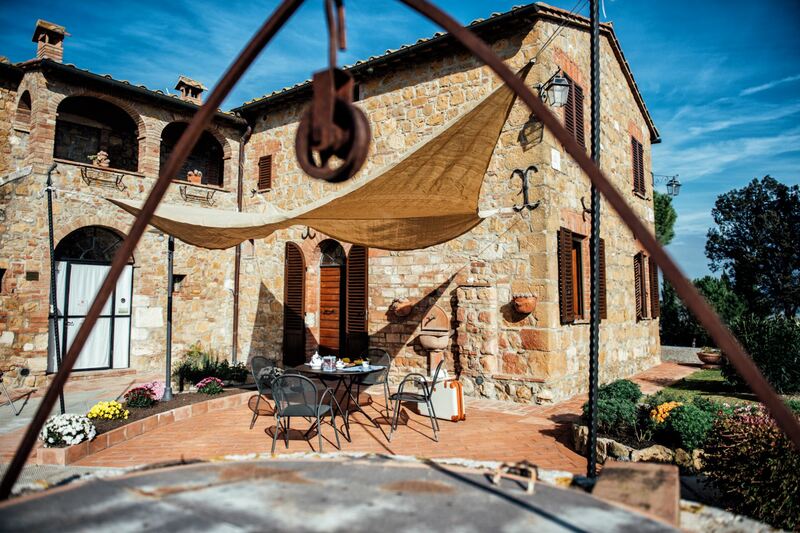 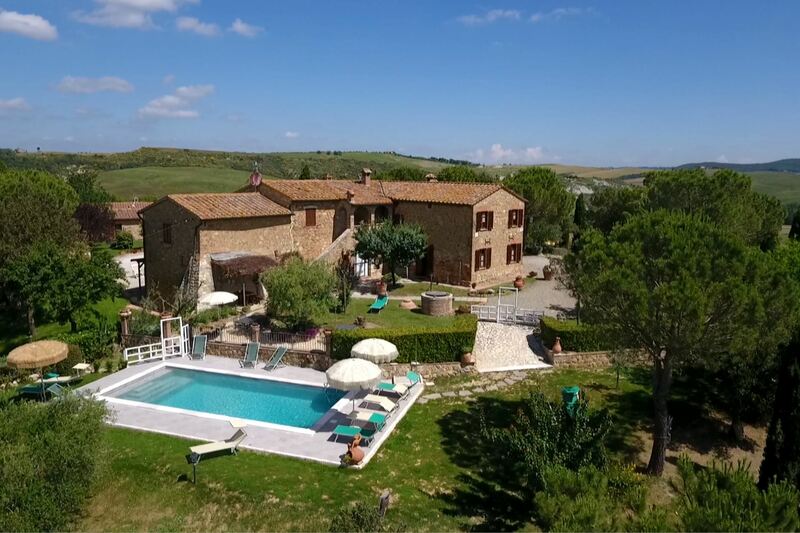 Palazzo Conti is only 8 km far from the spa of Bagno Vignoni and 4 km far from the beautiful Pienza, declared by the UNESCO a world heritage for its city plan and the importance of its monuments. 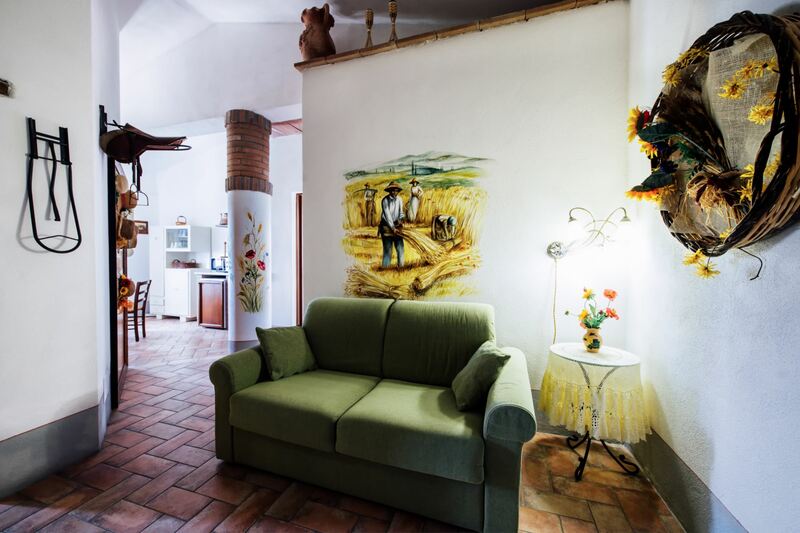 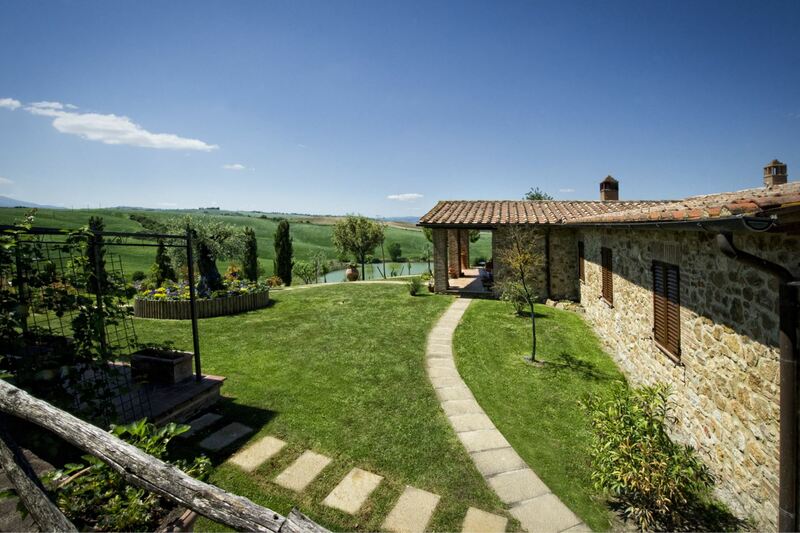 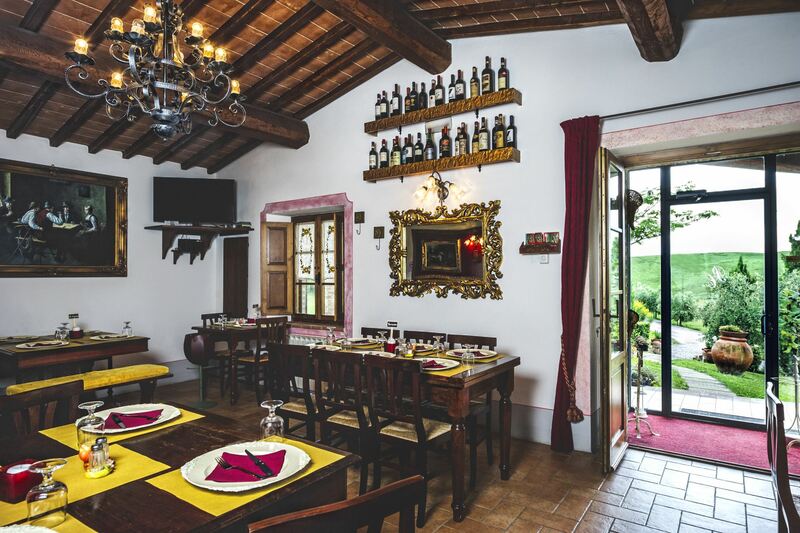 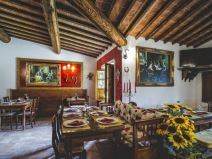 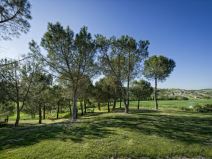 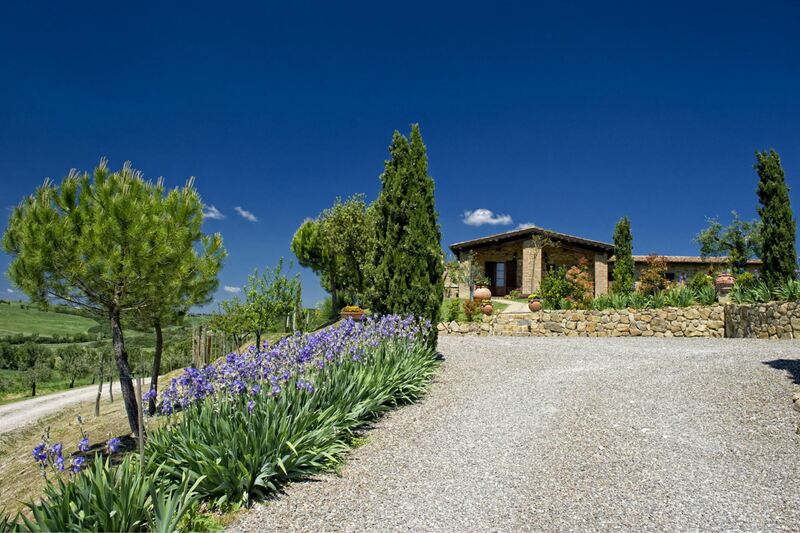 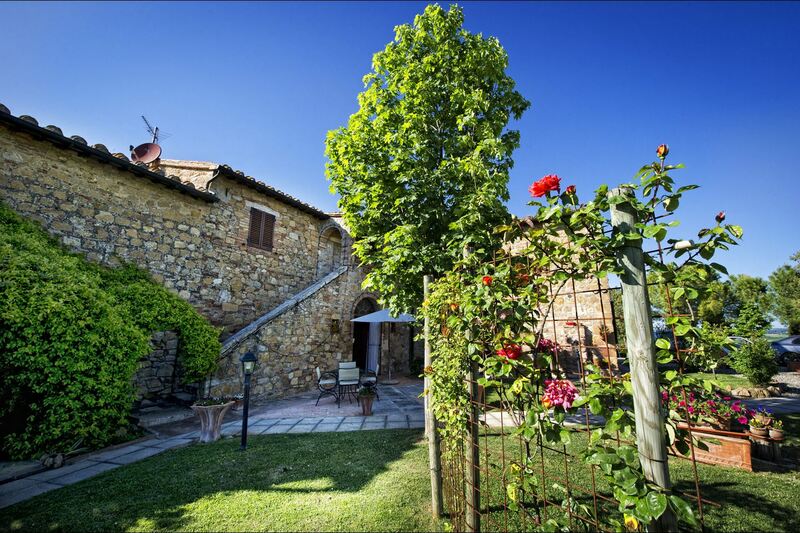 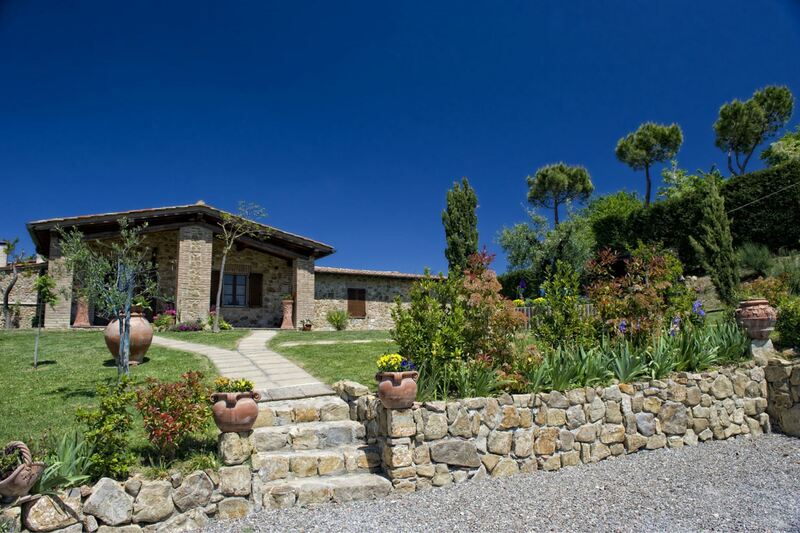 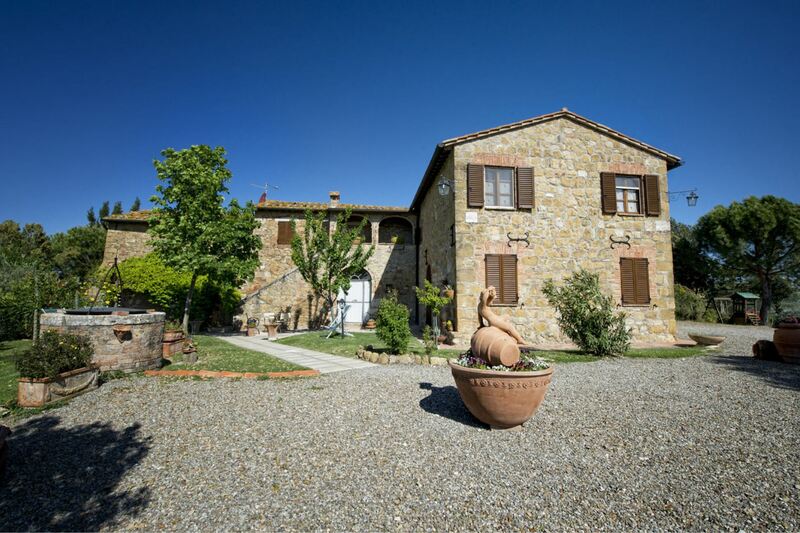 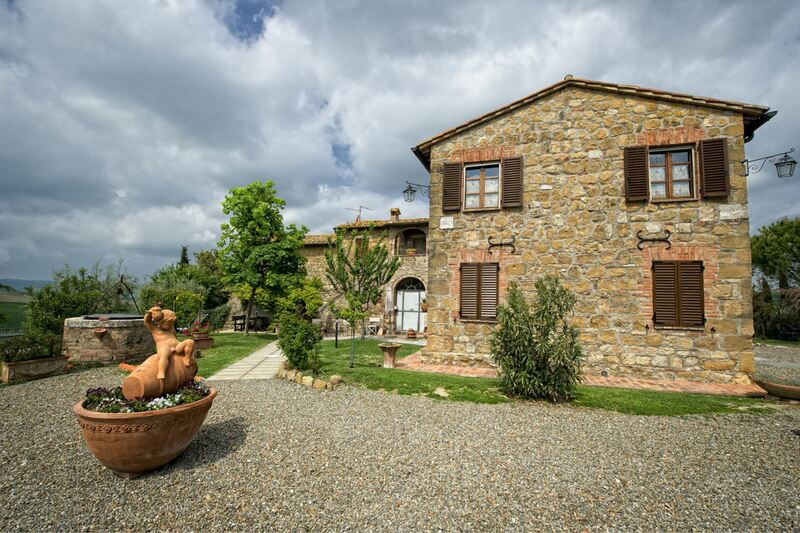 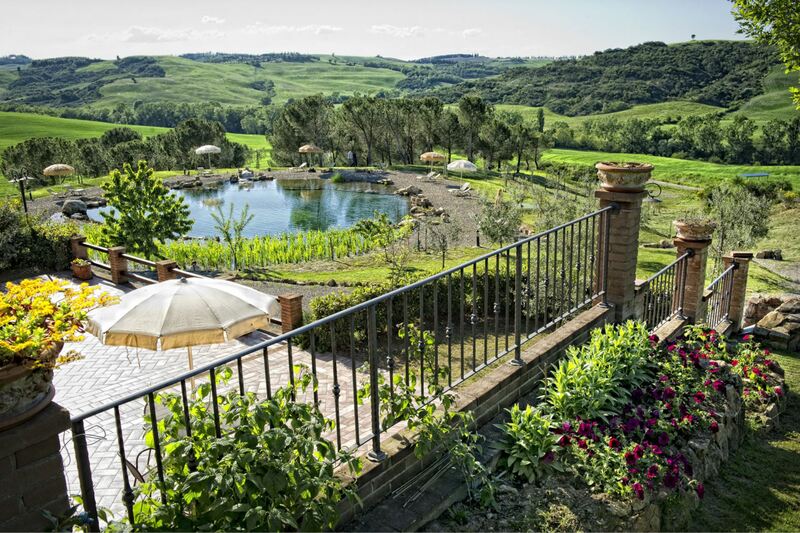 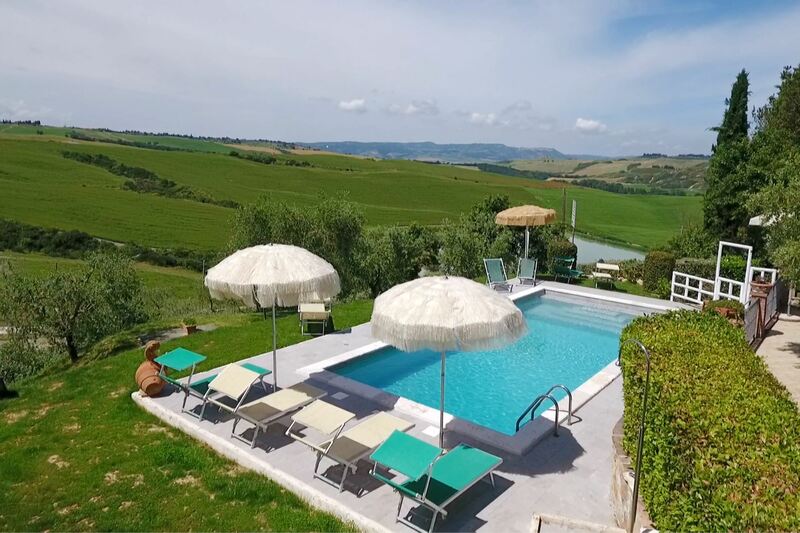 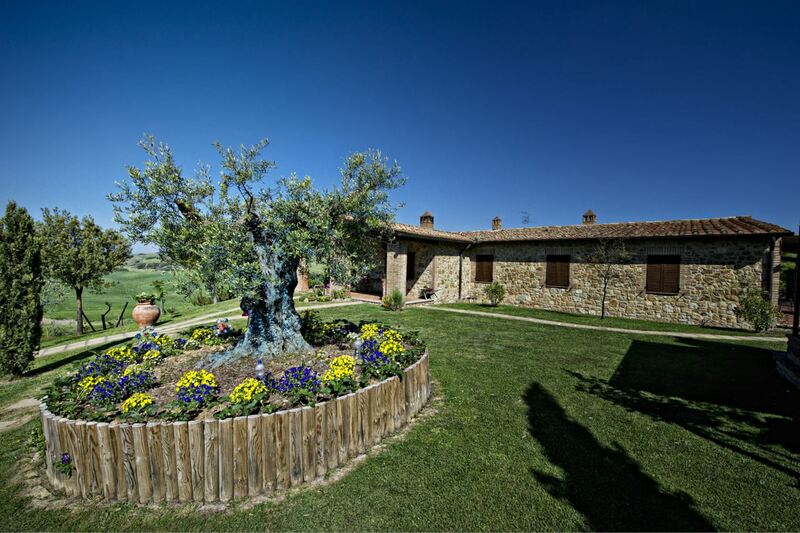 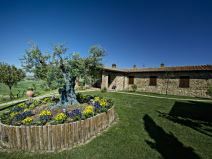 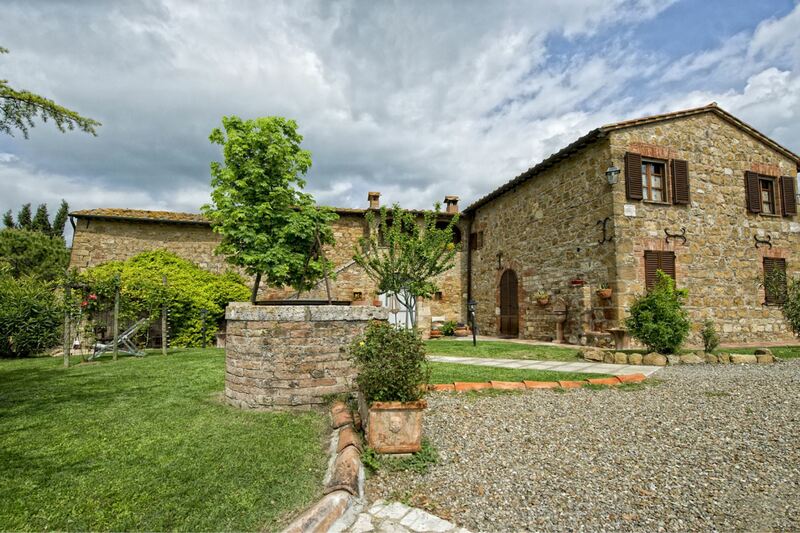 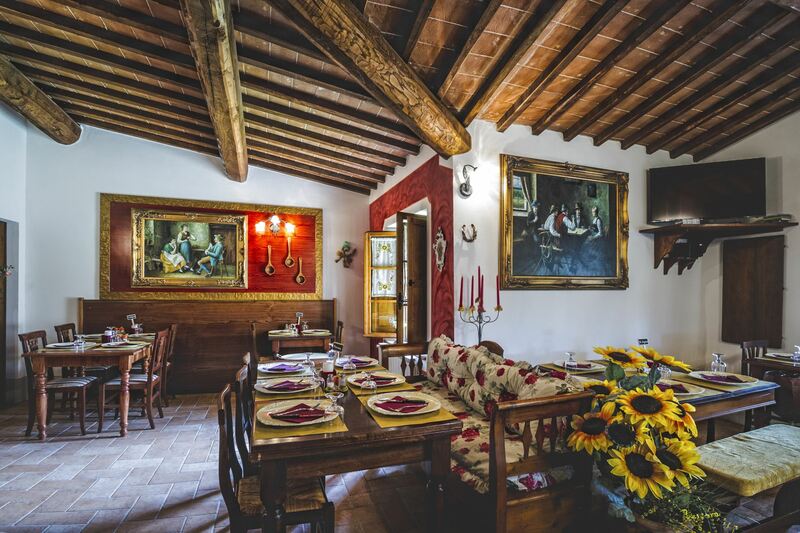 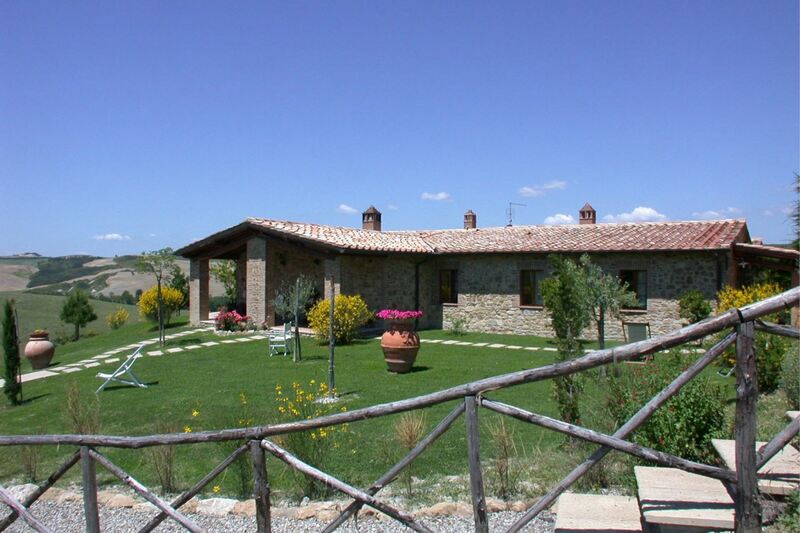 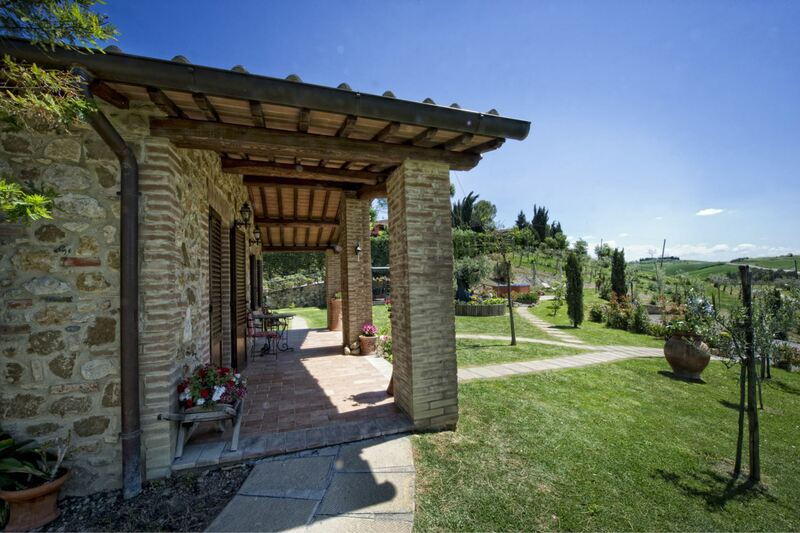 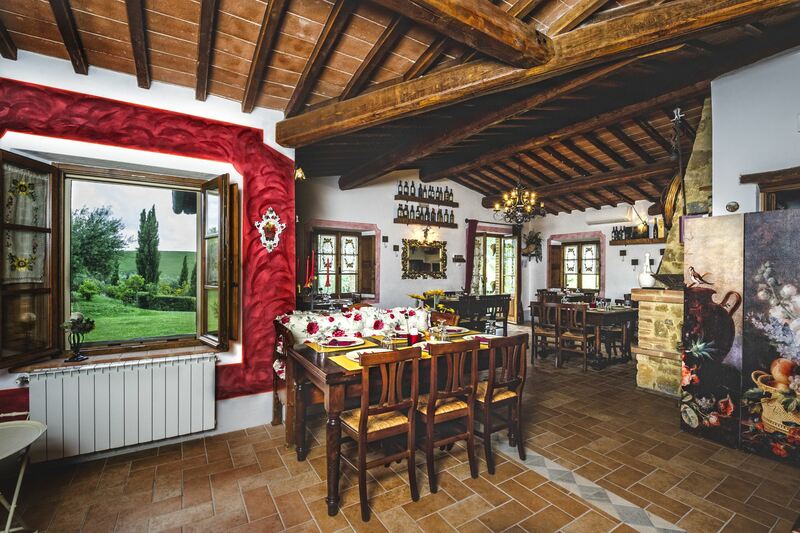 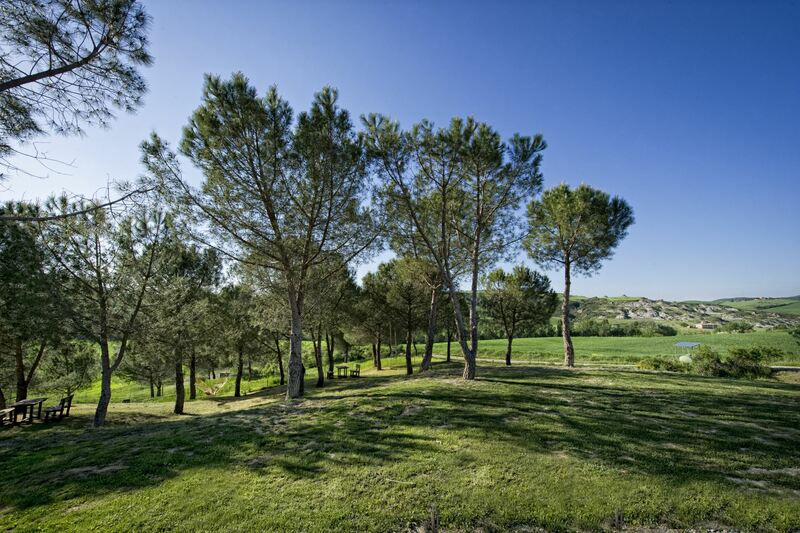 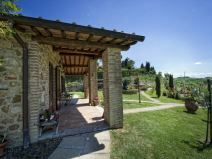 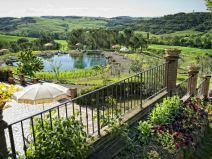 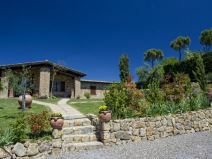 The farmhouse is located on a high, very panoramic hill inside a large agricultural farm, and it is composed by a main manor house divided into 4 apartments and by the 'Granaio' where we find other 4 apartments all comfortably and functional furnished. 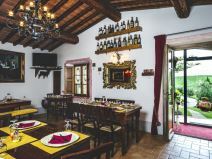 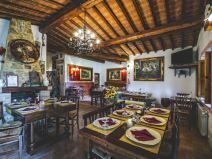 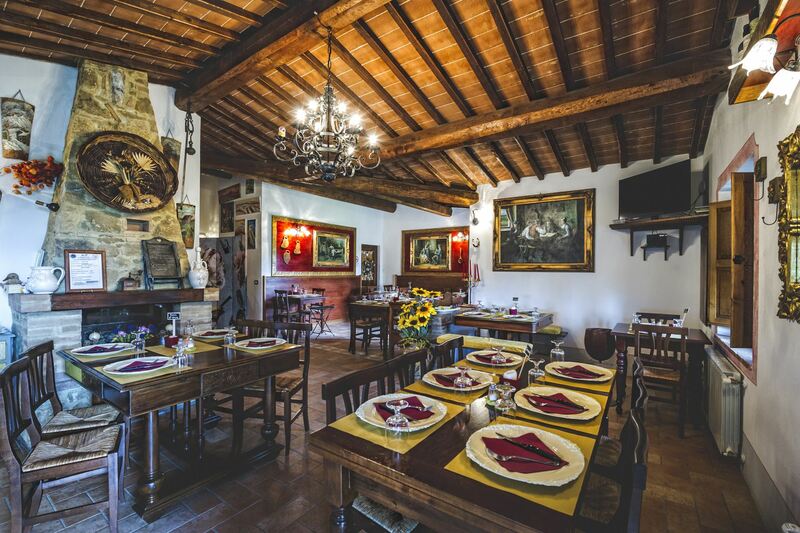 By the Granaio you will find also a small restaurant at guests' and public's disposal where you will be able to taste delicious Tuscan dishes. 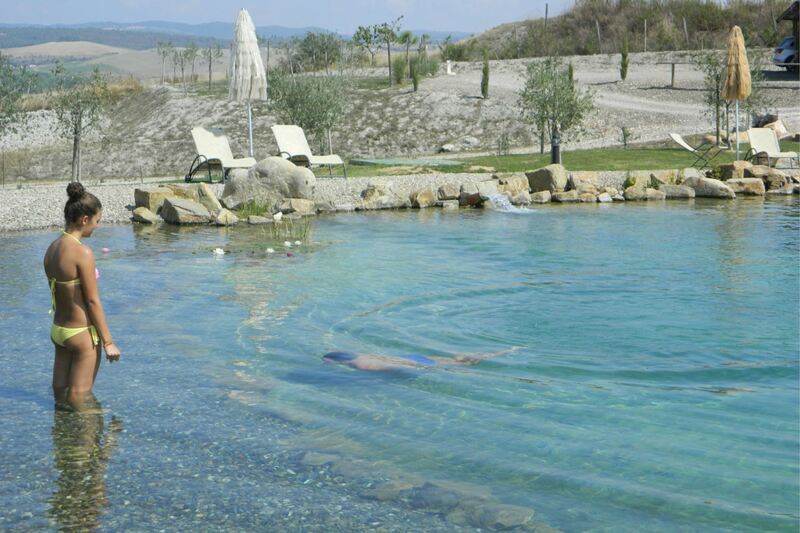 The swimming pool, the bio-lake and all facilities. 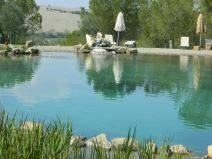 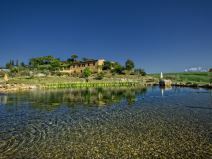 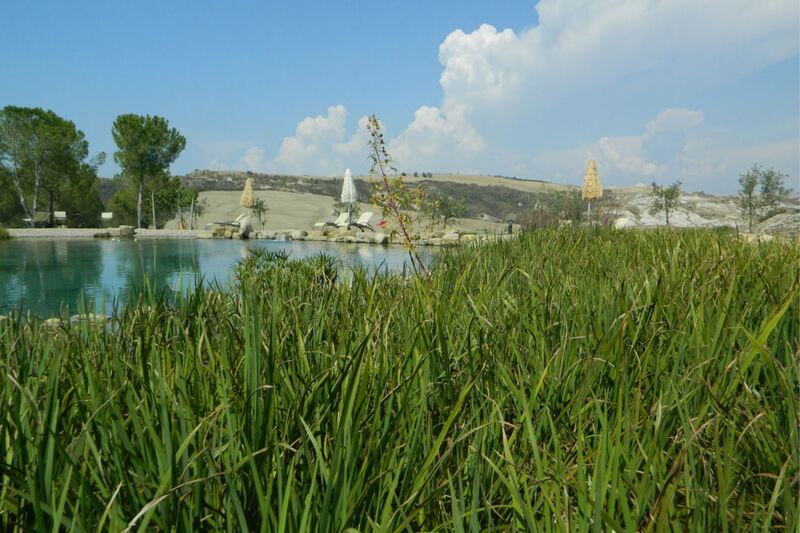 Our guest could also use a nice lake for fishing, a beautiful swimming pool (size mt. 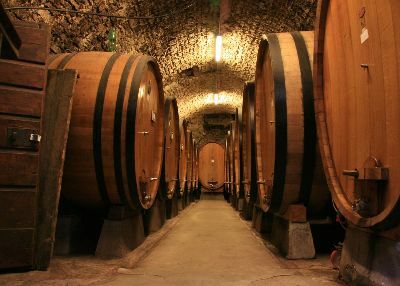 9x4, depth mt. 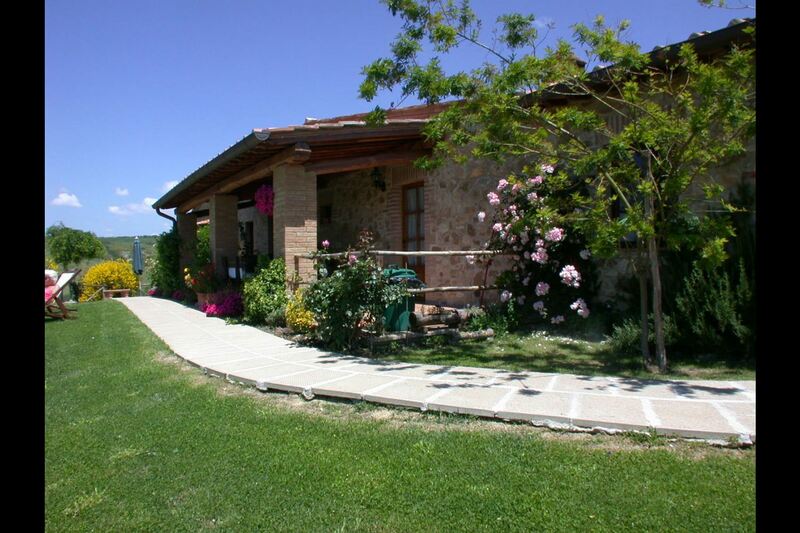 0,80-1,80) closby the main house, a barbecue, a table tennis, a children playground and laundry service on payment. 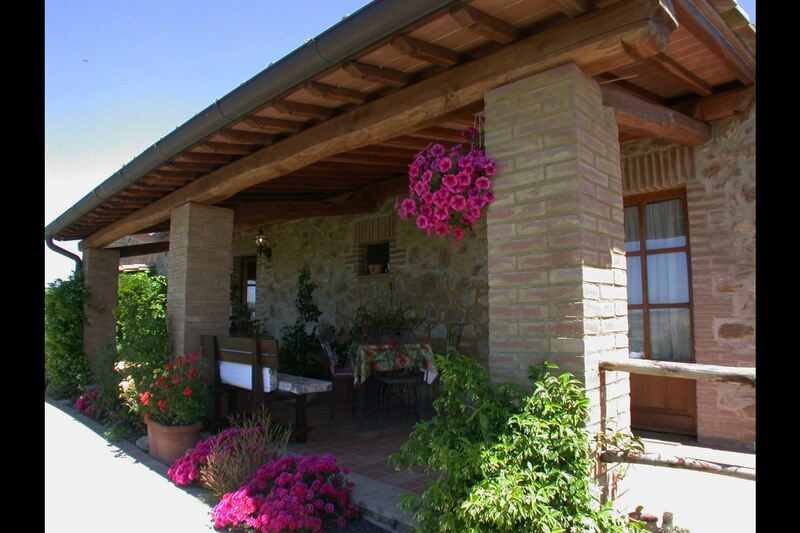 A stone's throw from the house 'Granaio' and around 200 mt. 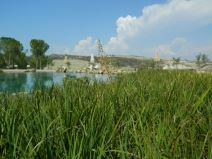 far from the main house the original and charming bio-lake, with water depuration made through water plants oxygenation (size around sqm. 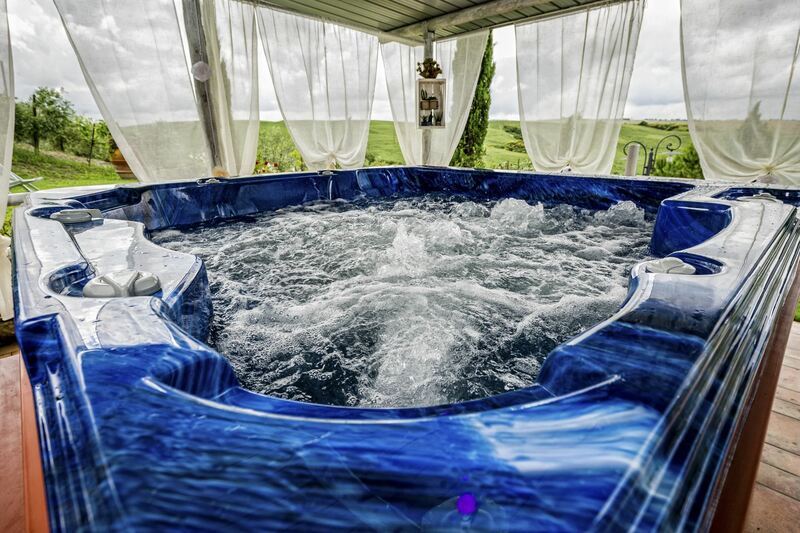 500, depth mt. 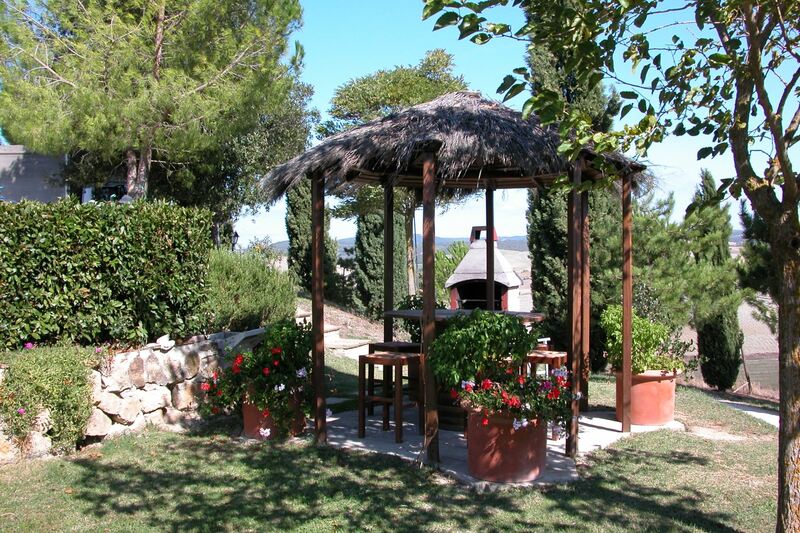 0,00-2,30) equipped with deck-chairs, tables and sun umbrellas. 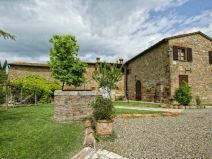 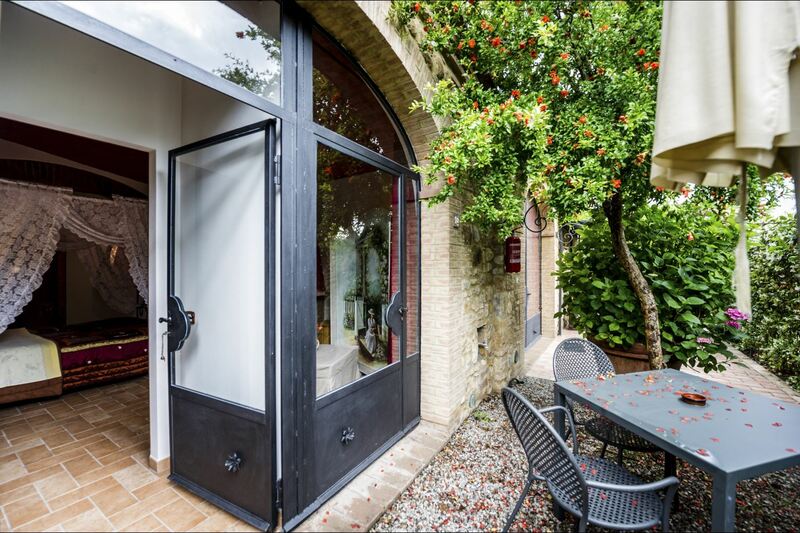 Ground floor apartment in the house Granaio, with entrance through private porch equipped with table and chairs to eat in the open, living-dining room with kitchen corner and double sofa bed, wide double bedroom, bathroom with shower. 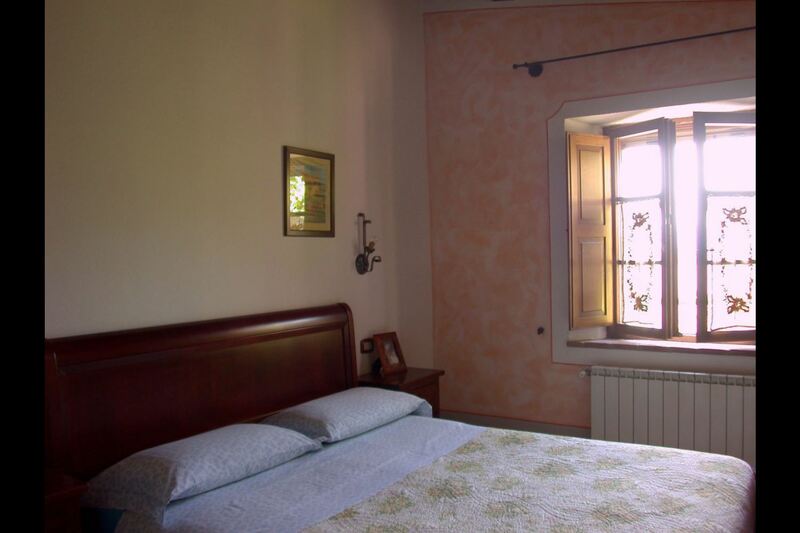 EQUIPMENT: Air conditioning, oven, moka coffee maker,TV, high chair, hairdrier in every bathroom, Wi-Fi Internet access, fans in every bedroom. 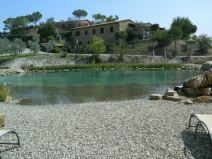 Shared pool open from 20/04 to 12/10. 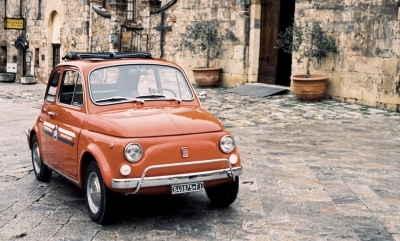 Air Conditioning Laghetto and Ponente only. 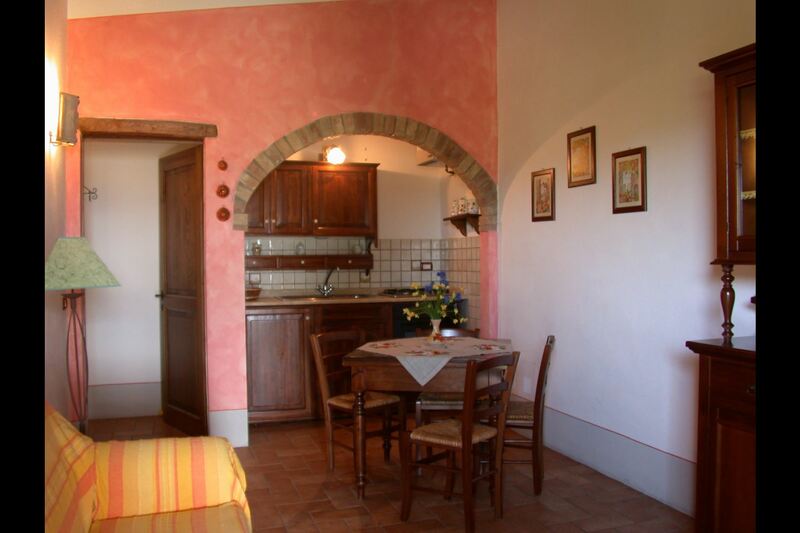 Breakage deposit Euro 200 per apartment, Corbezzolo Euro 300 (payable in cash on your arrival and held by the owner for the duration of your stay). 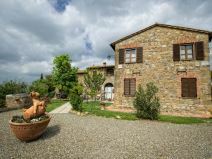 Obligatory final cleaning: Melograno, Cipressino and Ponente Euro 40, Ginestra, Laghetto and Cortile Euro 60, Crete Euro 70 and Corbezzolo Euro 80. 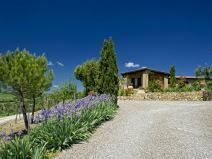 Heating: Melograno, Cipressino and Ponente Euro 15 per day, Ginestra, Laghetto and Cortile Euro 25 per day, Crete Euro 30 per day and Corbezzolo Euro 40 per day (if used). 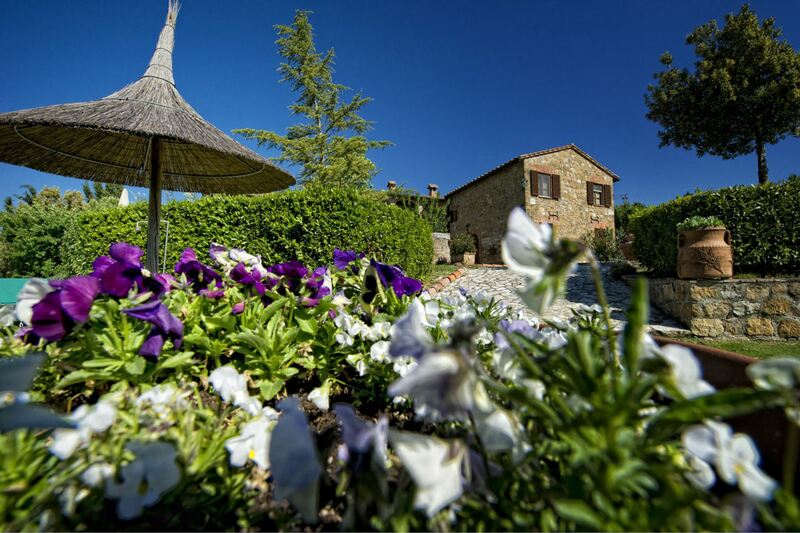 Tourist tax Euro 1 per person per day. 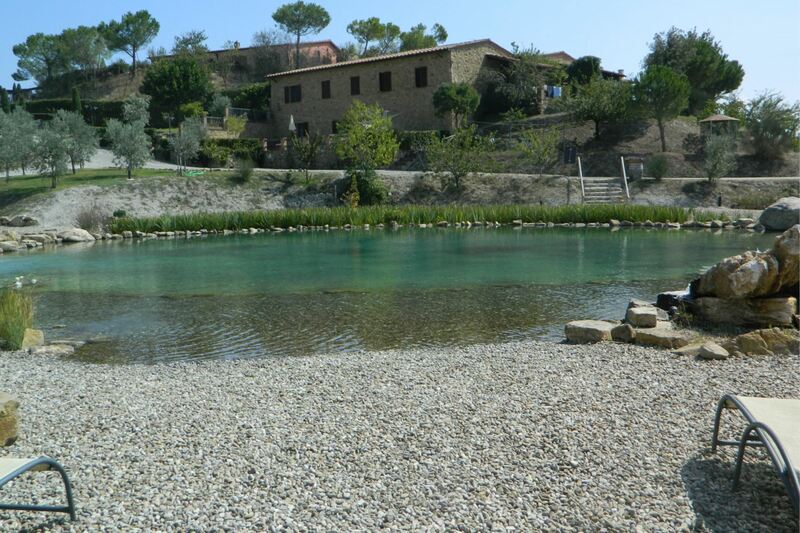 Children up to 14 years do not pay. 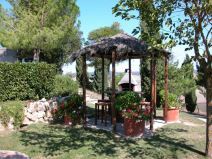 Wood for fireplace Euro 10 each basket (if used). 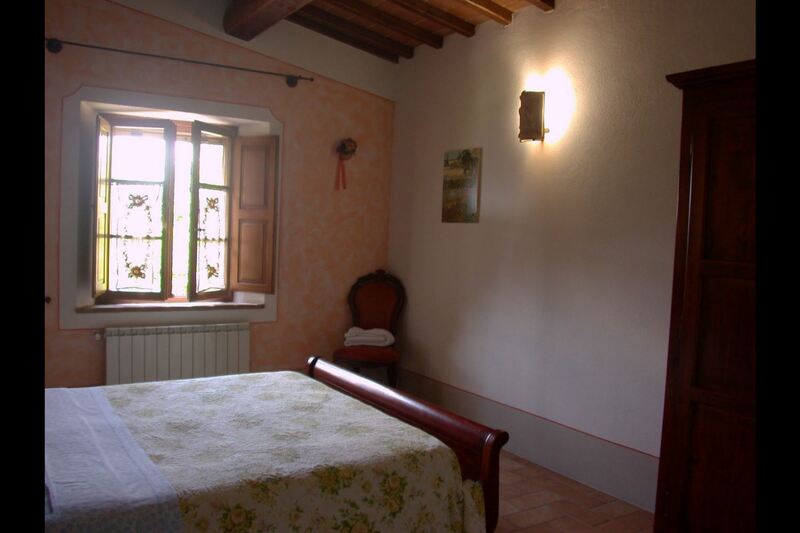 Baby bed available on request on payment of Euro 30. 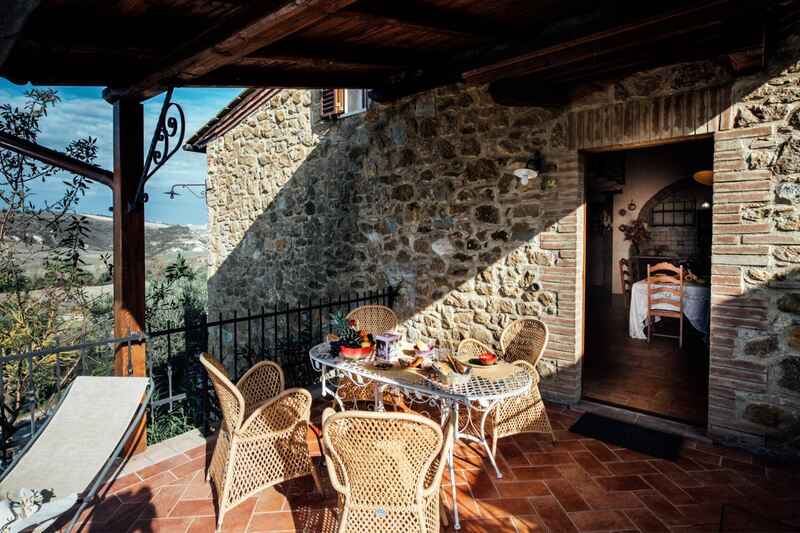 Highchair available on request on payment of Euro 15. 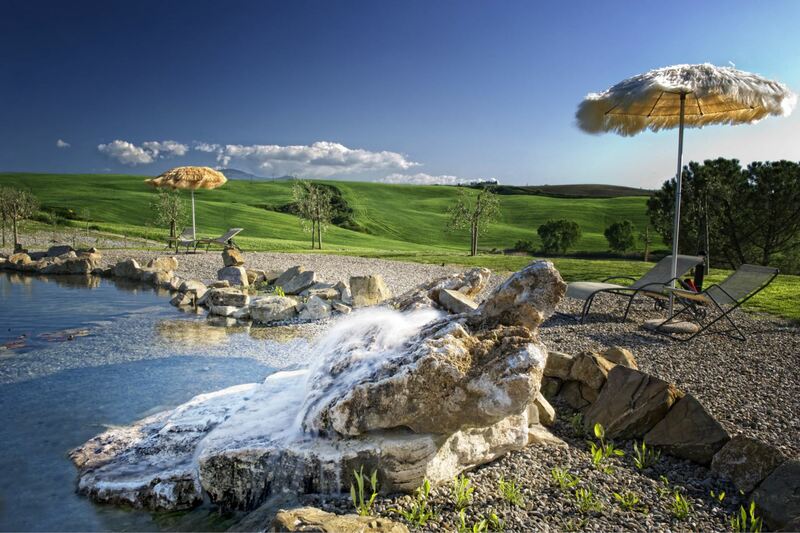 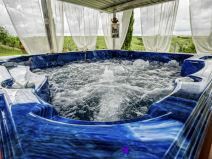 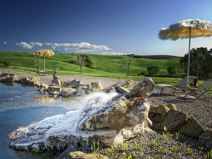 Outdoor Jacuzzi Euro 6 per person, heated Euro 12 per person (if used – from 14 years of age onwards).